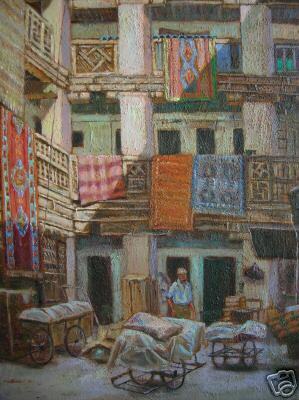 MAGNFICENT ORIGINAL OIL PAINTING "Girona rug trader. " BY THE FABULOUS ARTIST DAVID ALDUS. This is part of a series of Paintings completed by Aldus in Girona,Catalonia. (Highest price received for one of his paintings is £14,000! "Lot's Wife." Absolute investment opportunity!) Measurements height 28 inches by 22 inches Oil on prepared board. .